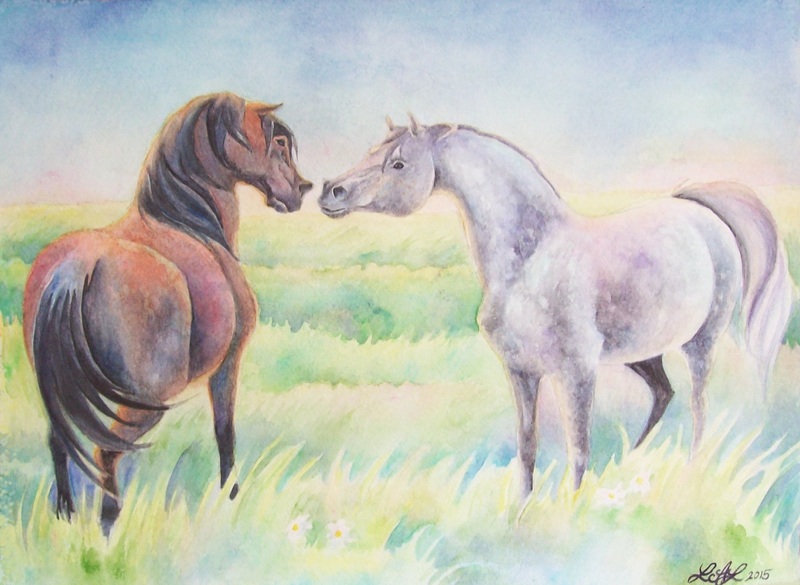 “Greeting” is a painting I made to try to capture that refined moment of horse etiquette. 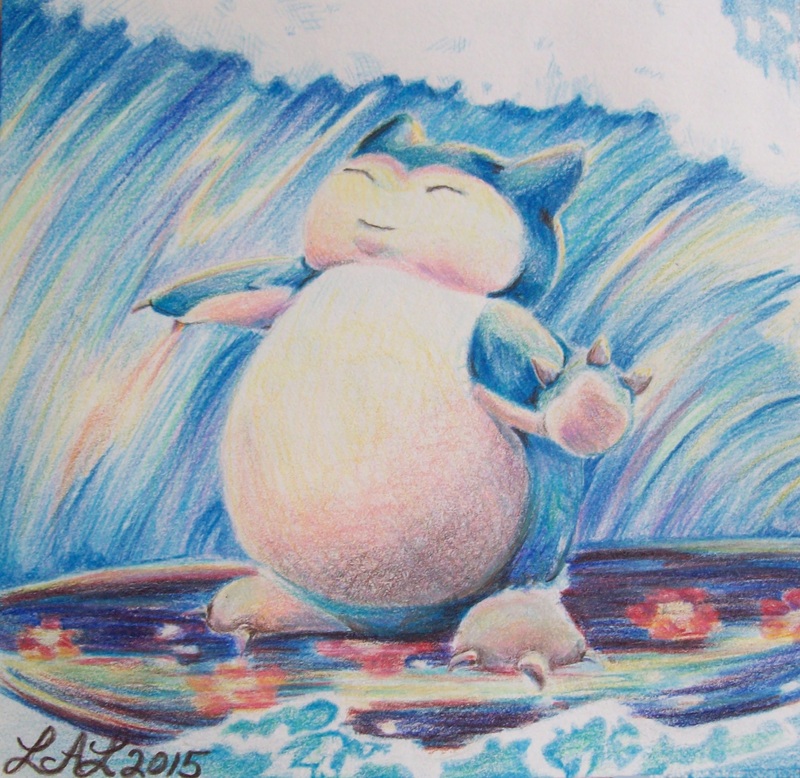 Just Good Fun: Snorlax Used Surf! 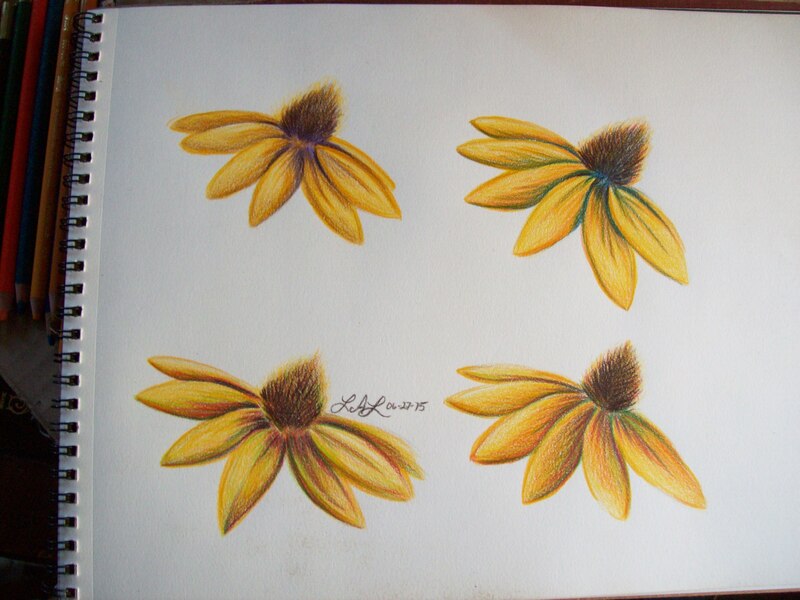 After a few weeks with no new work, I decided to change things up a bit with a quick and dirty little colored pencil picture. Anyone who is familiar with the world of Pokemon knows about Snorlax, the Sleeping Pokemon. While world famous for eating and sleeping, Snorlax can also learn the technique surf to ferry the player across water in the Pokemon games. So in the spirit of summer, I decided to make a little sketch of Snorlax hanging ten. Particular challenges in this project were portraying the transparency of the wave, and the water shining on the surfboard. 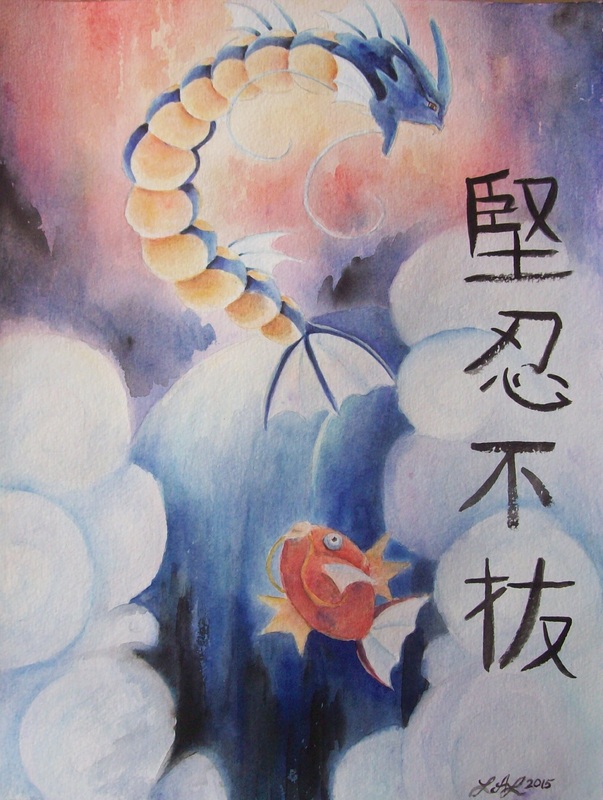 In Chinese and Japanese mythology, it is said that if a carp swims upstream and climbs a certain waterfall, known as the Dragon’s Gate, he will be transformed into a Dragon. This legend has made the carp (also called koi fish) into a symbol of perseverance. The koinobori is a kite shaped like a carp that is flown on Children’s Day in Japan. Blowing in the wind it resembles a carp swimming upstream and is meant to express the hope that the children will grow up with the strength of the dragon. This legend is the source of the seemingly bizarre relationship between Magikarp and Gyarados in the Pokemon universe. Magikarp is an infamously weak koi fish Pokemon which if trained to level 20, through the perseverance and persistence of the trainer, becomes the powerhouse dragon Pokemon Gyarados. The in-game technique of waterfall, used to swim up waterfalls and usually earned by the player late in the quest, is probably also a reference to this legend. Speaking of Gyarados, why is this Pokemon, which clearly looks like a dragon and is based on a legend of a dragon, not a dragon type? And why does it gain the disadvantageous addition of flying type when evolving from the pure water typed Magikarp? I, like others, suspect that Gyarados was intended to be dual typed water/dragon. I imagine this was changed at the last minute due to type weaknesses and resistances; dragon was only weak to two types: ice and itself, while the second type of water resists ice attacks. This would leave Gyarados vulnerable only to dragon type attacks, which in the first generation of Pokemon games consisted solely of “Dragon Rage” (which does set damage and doesn’t take weakness or resistance into account) thus making Gyarados invincible.